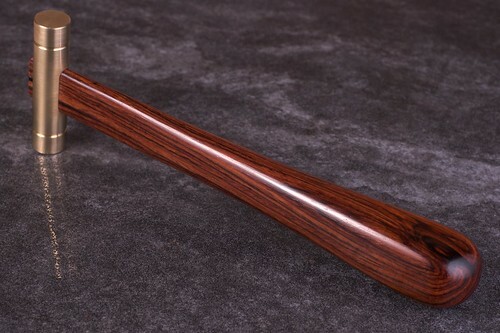 The head of the hammer is made in Brass, using my ancient but reliable metalworking lathe, the handle is Cocobolo (or Cocobongo as it has become known here by Claire and George). The handle fits into a milled slot in the head and is secured with an Ebony wedge. I just have to resist the temptation to go around the house tapping things with it, although I can’t claim to have made a particularly good start on that. 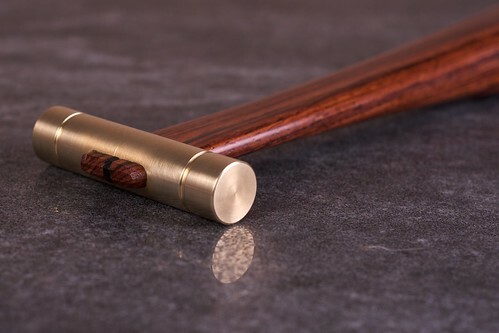 Beautiful hammer Ed. Far too nice to go hitting things with. Thanks for the comments on the hammer, glad you like it. I suspect that the combined cost of materials, my time and trans-Atlantic delivery would make the cost prohibitive. I’m sure there must be someone within the new wave of US toolmakers that could knock you one up easily, I know Ron Brese was developing a plane hammer. Yeah, I guess I could swing (pardon the pun) 100 UK sterling or something, but much more and I’d have to find an inferior second option! Thanks anyway..
btw;… not related to yours exactly, but I did get a hammer from this guy… quite impressive in a different way.. I bought his prototype and serial #1 as well.. he’s sold something like 150 so far.. about $150 US..